John Reid (center) hasn't played since the end of the 2016 season, but he says he's better than ever. When John Reid runs onto the field at Beaver Stadium for Penn State's opener on Sept. 1, it will be exactly 17 months since he tore the anterior cruciate ligament in his left knee during a spring practice drill, an injury that forced him to miss all of last season. Given how much he has wanted to play the sport he loves and how hard he has worked to return to action, he might be anxious, or downright scared, about experiencing that first hit, trying to fend off a blocker at his cornerback spot on a run play, or chasing a receiver over the middle in traffic. On the contrary — he doesn't fear it a bit. "I've done a whole lot. I don't really think about that anymore," Reid, a redshirt junior from St. Joseph's Prep, said at the start of summer training camp. "I had talked to some other people about when they got hurt and stuff like that. I have repped things so many millions of times. I've put myself in every awkward situation I could think of to mimic anything I could do in a game. "I feel good. I've done things so many times now, that it's just back to doing it normal." Reid is no ordinary football player. As cerebral and mature as a 22-year-old college student can be, he is a student of the game. He impressed Nittany Lions coaches when he visited Happy Valley before and after he committed and joins them in the film room to dissect plays. So, though he was forced to the sidelines last season, Reid was delighted when head coach James Franklin included him on the traveling squad for all away games — a significant move, considering the Big Ten allows just 70 players on the road for conference games. 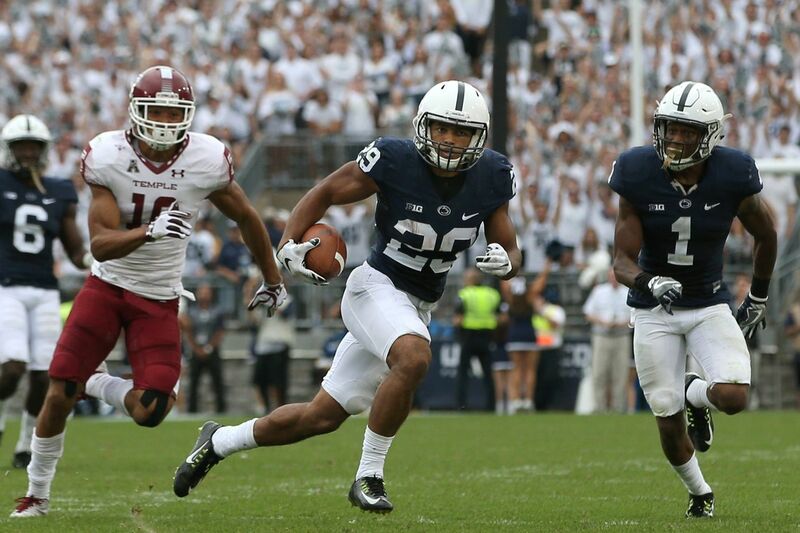 "I told Coach Franklin that I really appreciated that," Reid said. "Just being able to stay around my teammates the whole season, they kept me involved entirely. I've played since I was a freshman, so I was wondering how it was going to be if I wasn't traveling. So, when Coach Franklin said I could travel, that was really exciting." Reid said he was more of a helper than a coach, talking to teammates when he saw something from the sideline. John Reid breaks up a pass intended for a Southern Cal receiver during Penn State’s loss to the Trojans in the Rose Bowl in January 2017. It was the last game Reid has appeared in. Gabe Infante, Reid's head coach at St. Joseph's Prep, said Tuesday that he's not surprised Reid attacked his rehabilitation the way he did. He feels that Reid is ready to regain the form that made him an honorable-mention all-Big Ten corner in 2016. "I never had any doubt John would get to where he's gotten to," Infante said. "John's a very self-motivated, very driven young man who treats his craft like a profession. Honestly, I had no doubt he would get where he needs to be right now. He's very mature, and he's always been such. So, I'm very happy for him, because he works so darn hard, and it's so important to him." Reid participated in this year's spring practice, though he was kept out of the Blue-White game. He said he knew by the end of the spring that he was all the way back. Now that the season opener against Appalachian State is on the horizon, Reid feels as though he's "better than ever." He said that his rehab strengthened muscles he never focused on before and that he's sharper mentally. "It's like a muscle; if you want to get your quads bigger, you do little quad sets," Reid said. "It's the same thing here, always thinking certain things, doing mental exercises just to challenge yourself. When you think about the mental part and the physical part, people think they're so much different, but the training is fairly similar, doing it over and over again to be really good." >> READ MORE: James Franklin overrated? Please. Franklin also believes Reid is further ahead after sitting out 2017. "I do think sometimes when you go through an injury like that, I think it puts things in perspective, and you have to overcome adversity and those types of things," he said Tuesday. "So, I think he's probably grown more than a normal year, because of the adversity that he's had to overcome." Reid also returned punts before the injury, but it's doubtful he will resume that role. Special-teams coordinator Phil Galiano said that senior receiver DeAndre Thompkins, who was fifth in the nation in punt returns last year, is back, and senior running back Mark Allen and freshman receiver KJ Hamler are options, too. Knowing Reid, who was on back-to-back state-championship teams at the Prep, the way he does, Infante said Reid is ready to resume competing at the highest standards he has set for himself. And he's not going to be afraid to mix it up when the bodies start flying around in a game. "I think that's behind him," Infante said. "I think, if anything, John is going to be very excited, and his adrenaline will be rushing just to show everyone how good he is."